Problem: Dark green leaves, shiny leaves, clawing, weak stems, and overall slow growth. 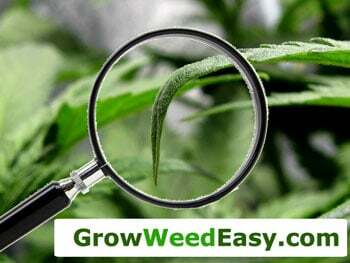 Marijuana leaves that are nitrogen toxic often get "The Claw" or talon-like leaves that are bent at the ends. They also do an odd curving (or cupping) that is often mistaken for overwatering, but is unique to nitrogen toxicity. You can see a "clawing" leaf pictured to the right and more pictures below (click each picture for a close-up). Leaves that turn into claws often start turning yellow and dying if the nitrogen toxicity is not treated, much like a nitrogen deficiency, only the leaves will continue to get more and more clawed. Leaves eventually turn yellow or brown and fall off. 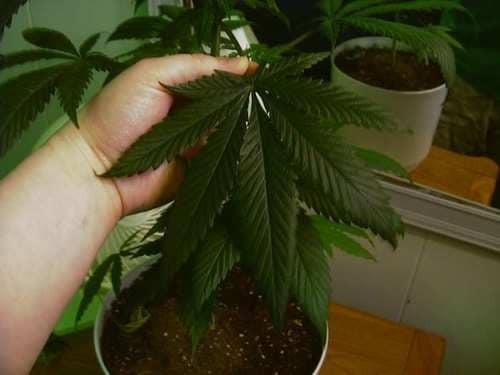 You can tell if yellowing is caused by too much nitrogen because the rest of the plant will be dark green, and the yellowing leaves will turn into claws first. The majority of times that growers encounter problems with nitrogen, it's from giving too much of it to their plants. 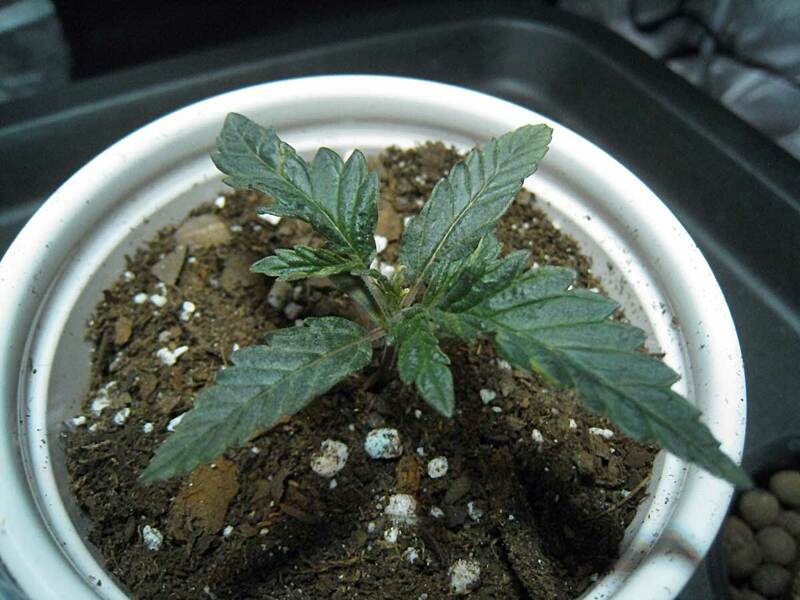 Many new growers accidentally give their plants give too much Nitrogen, especially in the flowering stage. This results in dark, shiny, clawing leaves. Your plant needs a lot of nitrogen in the vegetative stage, and it's generally hard to give too much as long as you're not going completely overboard with nutrients. Nitrogen is a big part of what makes leaves green, and is incredibly important to the process of photosynthesis (making energy from light). But cannabis plants need relatively low levels of Nitrogen in the second half of the flowering/budding stage. 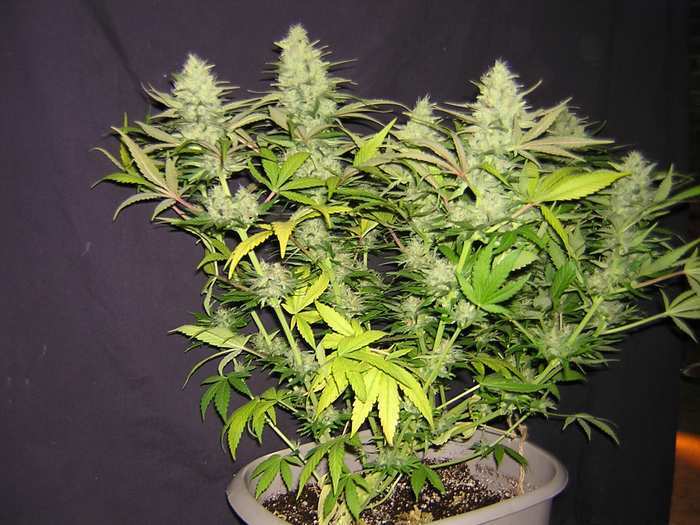 While your plants still need N (nitrogen) during flowering, too much N at this stage will prevent your plants from forming buds properly, resulting in lower yields, less potency and possibly inferior buds. 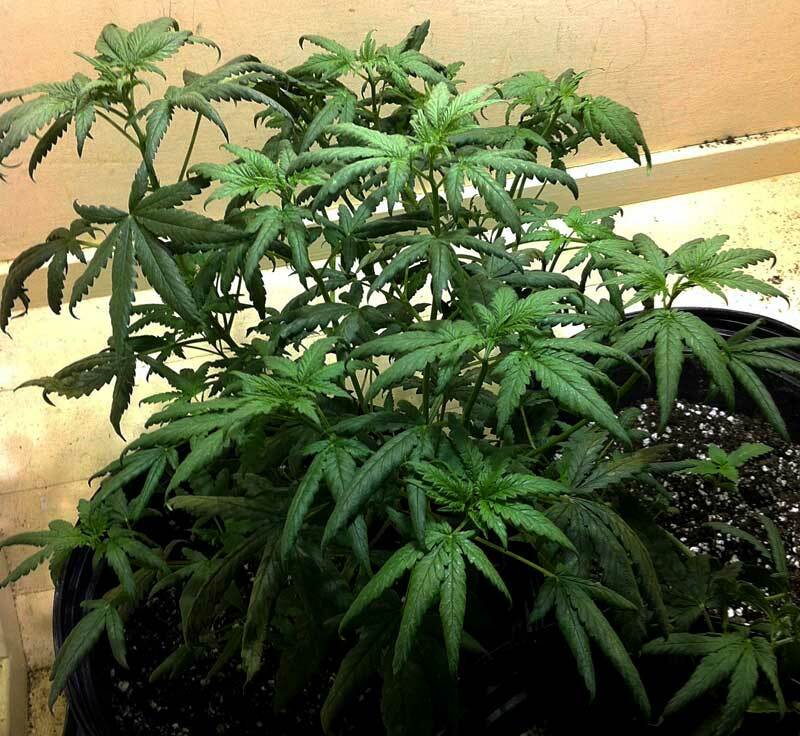 This is why it's important to avoid any type of "time-release" nutrients or soil (for example, standard Miracle-Gro soil) as they will keep giving your plant a lot of N even after its started flowering. Most complete plant foods that you get at a gardening store contain high levels of nitrogen (N). These nutrient systems tend to work well in the vegetative stage. It’s extra important to find a nutrient system with lower levels of nitrogen for the last part of your plant’s life. Many “Bloom” or "Flowering" style base nutrients are just the ticket. If you can’t order online and can't find a good one-part base Bloom formula locally, you do have other choices. Though not an ideal choice, most Cactus plant foods will contain good nutrient ratios for growing cannabis during the budding stage. So in a pinch, you can use the cactus nutrients that can be found at most gardening stores. Different strains react differently to nitrogen toxicity. Some plants get dark green leaves with no clawing. Some strains will get leaves that do the weird 90 degree bend at the tips, while other strains or individual plants start curling like claws and then turn yellow / brown and fall off like a deficiency. Yet these are all signs of too much nitrogen. Leaf tips may turn down, without signs of overwatering. Solution: Reduce the Nitrogen your plant is getting! Reduce the amount of nitrogen that is being fed to the plants. If you are feeding extra nutrients, cut down that amount. If you are in the flowering / budding stage, make sure you're using a formula that's specifically meant for flowering, or else it could have too much nitrogen. If you are not feeding extra nutrients, you may have "hot" soil that has been giving your plants extra nutrients. In that case, flush your plants with filtered, pH'ed water to help clear out the extra nitrogen. Effected leaves likely won't recover, but you should see the problem halt with no new leaves being affected. Wait! I'm not sure if it's Nitrogen toxicity! Ok, you ruled out overwatering, now what? When I first got started growing, everyone kept telling me that this particular kind of leaf clawing was caused by under or overwatering my plants, pH problems, or heat problems. Yet in my case, I knew that it wasn't over or under watering (I was growing in hydro, where roots grow directly in water and air stones are constantly adding oxygen). I knew it wasn't pH (my reservoir water had the right pH) and I knew it wasn't heat since the grow area was slightly cooler than room temperature. So then what was really causing my claw leaves? It's understandable that other growers were mistaken. It is true that many stresses will make any other problem worse. Plus overwatering can cause a similar kind of leaf clawing (learn more below). And if you do have nitrogen toxicity, than heat or pH problems will make the problem much worse. Now, you may or may not know that marijuana (or any plant) needs an element known as "Nitrogen" to grow. In fact, nitrogen is one of the 3 nutrients that are included in almost every kind of plant food. 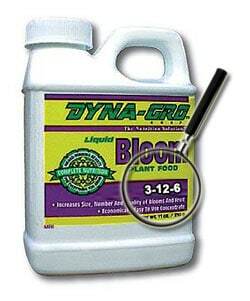 When looking at plant nutrients, you'll almost always see 3 numbers listed, like 3-12-6 or 5-10-5. These numbers represent the ratio of Nitrogen (N), Phosphorous (P) and Potassium (K) contained in the bottle. Just about all plant life on Earth needs these 3 elements to grow. The very first number, "3" in the case of the picture to the right, always displays the proportion of nitrogen in this nutrient bottle compared to the other 2 nutrients (Phosphorus and Potassium respectively). The reason nitrogen is in all plant nutrient formulations is because it's vital to plant processes. 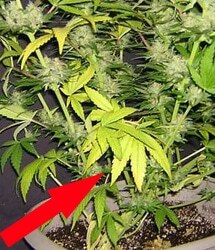 For marijuana plants, when they don't get enough nitrogen, the bottom leaves start turning yellow and dying. Left unchecked, a nitrogen deficiency can cause the whole plant to eventually die. However, this time we're the dealing with the opposite problem: nitrogen toxicity, or too much nitrogen. 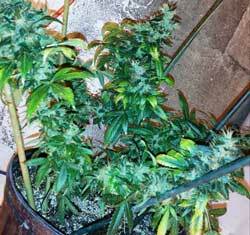 Marijuana plants that get too much Nitrogen in the vegetative stage don't grow as vigorously. Too much nitrogen is especially harmful in the flowering stage, because this will cause your plant to produce much smaller buds. If you react quickly and reduce your nitrogen levels at the first sign of toxicity, your plant will quickly recover. Note: Some strains with the word "Claw" in the name tend to do The Claw more easily than others. 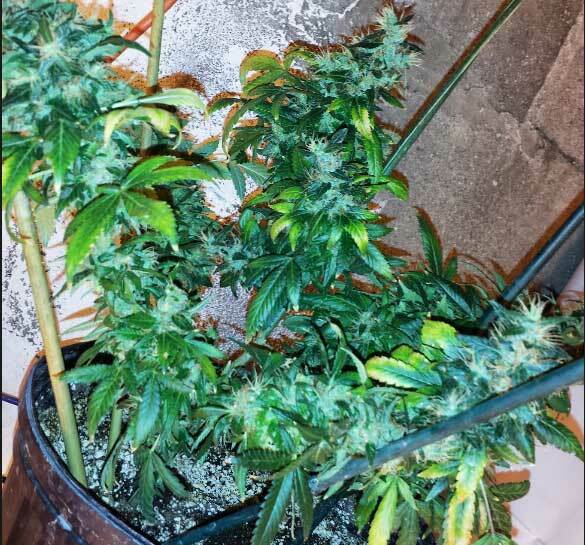 Problems with excess nitrogen are not common in the wild; it's a lot more common to see nitrogen toxicity on indoor plants, especially when overzealous growers go overboard with nutrients. 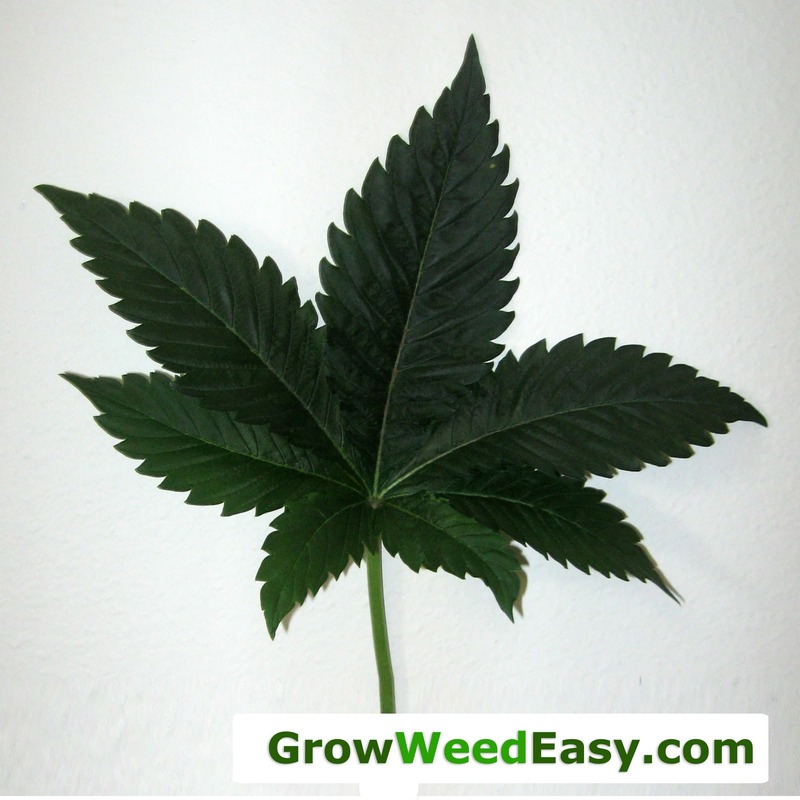 Occasionally you'll come across a strain or particular plant that likes lower levels of nutrients, and when this happens, it's important to realize the plant is showing signs of toxicity, even if all the other plants in your garden seem fine. Leaf tips turn down, without signs of overwatering. The distance between the leaves to the lights or irregular light patterns from reflectors often seem to affect the condition, which is why many growers believe that light is somehow causing the problem. You may notice this clawing first appears on dark green leaves that aren't getting enough light (they aren't able to use up all their nitrogen and become nitrogen toxic). If you use vegetative plant nutrients during the flowering stage, then they'll deliver too much nitrogen. This is why you need to get special nutrients meant for the blooming / flowering stage. You'll notice that flowering nutrients always contain a smaller percentage of nitrogen (the first number) compared to nutrients for the vegetative stage. 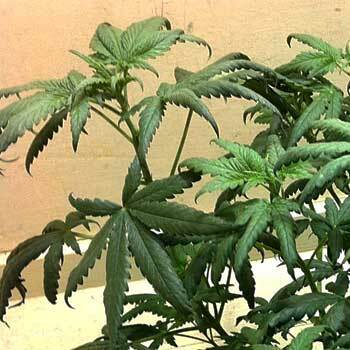 Learn more about marijuana nutrients here. Many growers mistakenly keep raising nutrient levels or adding additional nitrogen when they see yellow leaves in the flowering stage, not realizing that it's natural for plant leaves to start yellowing as harvest approaches. Adding too much nitrogen in the flowering stage can cause nitrogen toxicity even when you can see yellow lower leaves. Nitrogen toxicity in flowering results in smaller yields and airy cannabis buds, so make sure to watch out! Note: During the last few weeks before harvest, marijuana plants starts pulling all the remaining nitrogen from her leaves as part of the bud-making process. 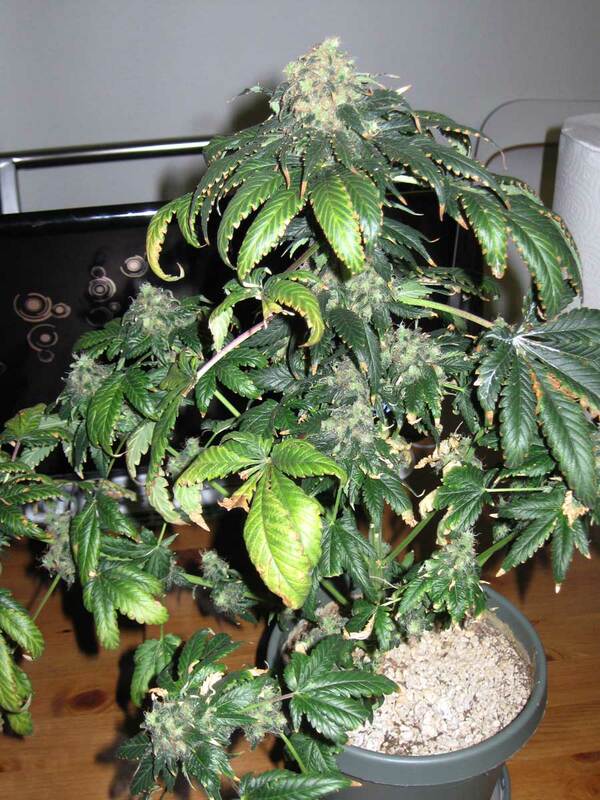 This causes yellowing leaves starting towards the bottom of the plant. This is part of the natural flowering process and you don't need to fight it. You may notice that marijuana leaves are yellowing in almost all pictures of marijuana plants with big buds that are close to harvest. You tend to get smaller yields at harvest from nitrogen-toxic plants with dark green leaves. It's Normal For Marijuana Leaves To Start Turning Yellow As Harvest Time Approaches, Don't Keep Adding More Nitrogen! 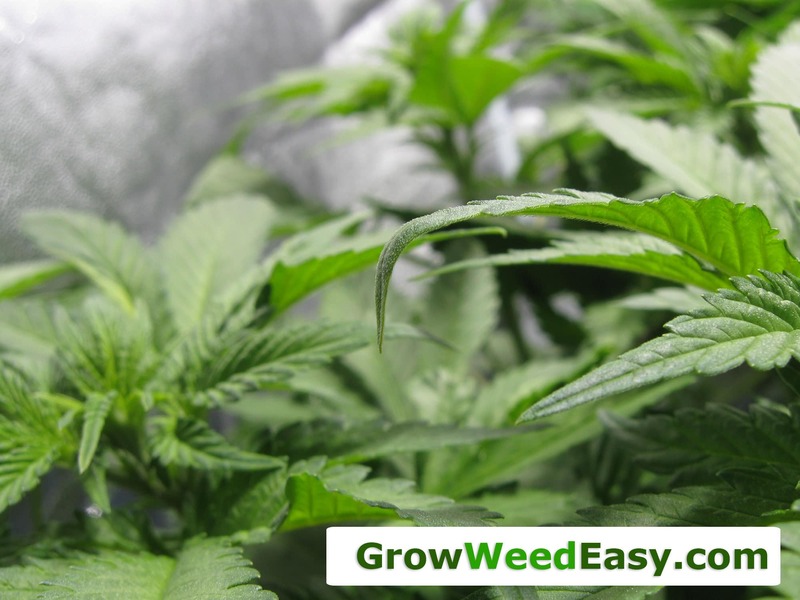 I know a lot of marijuana plant problems can look similar, but now that you're armed with the right information, you'll know exactly what to do if you see Nitrogen Toxicity affecting your marijuana plants.